For Angelo Card, owner of Custom Shoe Repair in downtown State College, fixing and crafting shoes by hand is just something he grew up doing. "It's kind of like farming," says Card. "You're always around it. My entire family worked here. Everybody worked with shoes." Card, 44, was just three years old when his grandfather, Angelo N. Card, bought a little store on 210 S. Allen Street in 1973, converting an old barber shop into the new home for his cobbling business. Card spent countless hours learning tools of the trade from his grandfather as a young boy, and at age 12, he began repairing shoes in the place he calls home. "We had good times in the shop that most people wouldn't understand," he says. "When you think of your childhood, you're thinking of your childhood at home. This was it. The house, basically was just a place to sleep." "I have more memories of this shop then I do of the house," says Card, who grew up here and attended State College High School. When his grandfather was diagnosed with cancer and looking to sell the store, Card wanted to continue in his grandfather's footsteps, but wasn't sure if he could handle the daily grind of being a small business owner. "I was working for him, and really didn't have interest in buying the shop," says Card. "I liked doing the work, but being a business manager is a pain." However, he noticed something about the man who was set to buy the store -- something he didn't like. He wasn't a good craftsman, and in Card's opinion, was just looking for a way to make a quick buck. The shop wasn't a priority for him. Card believed he was going to run the store into the ground, erasing the legacy he and his family worked so hard to build. So at the age of 24, he jumped at the opportunity to become the new owner. "It was a smart move," says Card. "You're either going to work for the guy, or you're just gonna own it. Went to the bank, got a loan, and here we are," he says with a grin. For 30 years, Card has been working as a full-time shoe repairmen. He once held a job doing upholstery work for a car shop, but still continued to repair shoes at night. Beginning each day at 7:30 a.m. with coffee and a cigar, he says there's no substitute for that feeling of accomplishment after a day of hard labor. Repairing close to 50 shoes a day. His shop is open for business five days a week. On the weekends, you'll find the doors locked, but the light's still on. Card is in the back next to the main finishing machine, doing the sanding, shining, trimming, "lifeblood of the shop", cobbling seven days a week. "I like the older ways," he says. "I like working for a living and being tired at the end of the day. There's a real contentment in working hard, laying down, and having a good night's sleep." Card doesn't even take a lunch break. In fact, in the three decades he's been cobbling, not once has he ever left to go get something to eat. No sit down meals. No fast food. When his stomach starts to grumble, he'll grab a pack of peanut butter crackers or Little Debbie cakes off the dusty shelves, next to the piles of shoes, leather, and polish, and have a snack. "That's all I've ever done," says Card. "A full lunch and going to take an hour break might be a beautiful thing, but I'm in the mindset, 'you don't miss what you don't know.' I've never done it, so I'm happy. This works for me." Card considers himself "old-school", and you can see why when you walk in the door. Rustic wood panels cover the walls, while stacks of newly-repaired shoes wait in neatly-packed brown paper bags on a shelf by the counter. Next to the door, a high-backed chair sits a few feet off the ground, ready for customers who want an old-fashioned shoe shine. His inventory system is old-school too. When customers hand Card their shoes, he attaches a small yellow tag next to the laces, rips off one end, and hands it back to the customer as a receipt. Some have called the system archaic, and would like to see a computerized system instead. His response? Not a chance. "I don't want to modernize it," he says. "This system has worked for over a hundred years. Why would I change it?" Like many craftsmen, the quality of his work is something Card takes great pride in. Most of the craftsmanship, he says, is something customers will never see. Even though the average person couldn't tell a good repair job from a bad one, Card says he always puts in his best work because his name and reputation are attached to every shoe that leaves his capable hands. 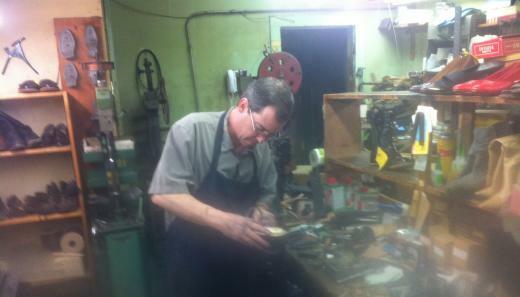 He picks up a shoe above the polishing machine and turns it over to reveal a new sole he put on a few days ago. "You take the care to make sure that the sole you're putting on is the same way you had it on," he says, brushing his fingers over the smooth surface. "You take care of your splice, make sure everything's smooth, seamless. Some guys just don't care. They'll slap it on and leave a big hump," he says, pointing to where the sole of the shoe meets the heel. "Most of what provides the craftsmanship is what you never see. It's on the inside." He points to the pair he's currently working on, a black boot with a sole in need of re-stitching. The "welding", the strip of leather that outlines the bottom of the shoe, was worn out. The factory that manufactured the shoe had done a poor job of stitching. Card is replacing it. "Not everybody would," he says. While it might seem obvious to some, Card knows there are people out there in all professions who try to get by doing as little work as possible. Unfortunately, some people take advantage of their customers. "If you're gonna lie your way to profit, that's a short life span," he says. "We've been in this room for 40 years. ... I've never believed in a fly by night business -- and I don't want anybody doing that to me." Caring for a wife and four girls, the two oldest are Penn State students, Card certainly understands the value of a steady income and good business to a working family. However, some people who come into the shop looking to get their shoes repaired are turned away. Remarkably, Card will often advise against repair if the cost outweighs the price of a new pair. Leaving extra money on the table, he says, is the least of his concerns. "You're never going to be rich doing labor," says Card. "It's about doing a job that you like, raising your family. A good, small life." In the end, it all comes down to a sense of fulfillment. Of working with your hands. Of being autonomous. Of doing something you can be proud of. "I was taught to build a shoe with quality. On a lot of the cheaper, the inexpensive, the copy shoes - I have to put it there." He hesitates for a second. "Well, I don't have to. But it goes back to pride. So I do." 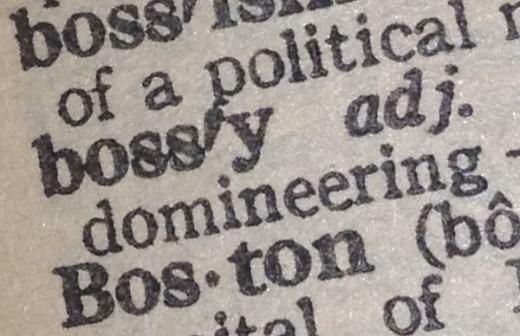 There are worse things than being called bossy. Facebook Chief Operating Officer, Sheryl Sandberg, has teamed with the Girl Scouts of America in a campaign to ban the word bossy. Citing a discouraging message and negative labeling for females who are seen as aggressive or "bossy," the mission is to support girls and women in their efforts to lead.